That's awesome that you are finally taking the time to correct all the little mistakes that held you back from wearing each piece. The F21 dress is my favorite. The colors are just so awesome! 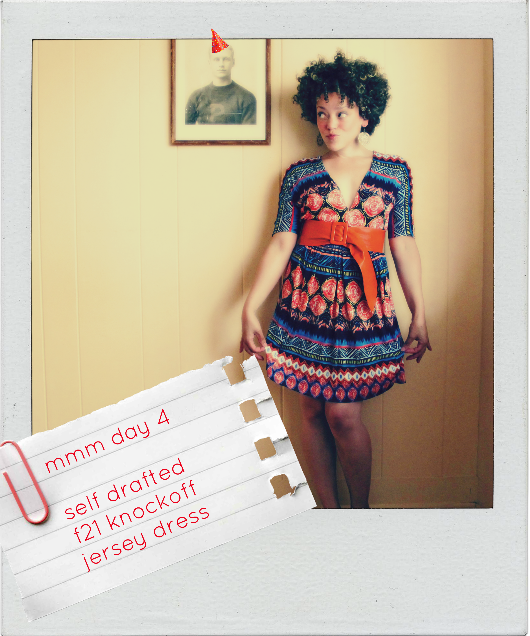 mmm day 4 dress- my fave of the three! But mmmD3 and D4 are super cute too! As for the revisiting of old projects thing... I hope I get some inspiration from you to do just that to some of my own makes. it is SO satisfying, you must do it! he got hats this week cause his wee head was cut off. poor dude. i am loving your sassy photos!! and i totally agree that MMM makes you fix things you would otherwise ignore!! it's like expanding your closet tenfold! Ooh, I'm so glad you're getting some use out of that sassy leopard print! I love it! Way too hot to stay buried in your closet! Your poses are the best and I looove that knock-off dress. It's darling. Really, everything you make is fantastic. I love all of your creations! The F21 knock off dress is to die for! OMG. Loving all your photos! I'm so with you in that I've got little niggly things about some of my me-mades that I need to fix before I wear them...lol. MMM is the perfect time to do it!! wouldn't have done it without MMM. bonus, dude. You look like a total rock star - I am absolutely loving your outfits! Love the outfits! The batwing dress is my fave, I loves me a batwing. As an aside, I love the accessories given to your fellow in the photo, gave me a good Tuesday morning giggle! he is there to please! You rock. Totally loving all the looks here. thanks girl, nice to see you here. love all the photos! the forever 21 knock off dress is so cute. i love the print. i feel the same way as you about some clothes i made for my self..some things are off or the finishing details don't go well or something and i end up letting it sit in my closet..
get that seam ripper out! You are too cute. New outfits every week. Doodles on the guy in the peanut gallery. Seriously, too cute. tee hee. next week i might play with flowers. I love these refashionings. I have a line of dresses that need to be "corrrrrrrected"...as the butler would say in THE SHINING. You're inspiring me to wield seam ripper and scissors! oh god, i'm going to talk to all of me me made refashions like that from NOW ON. My "this is going to Goodwill" bag gets constantly raided for remakes. Poor Goodwill. They'll never get some of these precious, precious handmade garments, lol. As for the parading, my sister bought herself a tiara at the hair store, and made herself a Miss Tammy sash with red glitter, to wear to the grocery store and the occasional whole-family supper. I don't think she'd mind if you stole that idea. i've got the same bag! and i. am SO. stealing sis's idea. that is the definition of Banner. Oh I just love them all! I've been finding that I need to get a bit creative with some of my less than stellar makes in order for MMMay to work! But most of my "fixes" involved cutting off offending pieces 5 minutes before I leave for work... Cheers to you for taking the time to do it properly! god, i love everything you make! i've been following your blog for a while now, i only just started sewing a couple of months ago and your blog is very inspiring! Isn't it funny how one tends to put off simple garment fixes? *glares at alterations pile* Love the last look especially! 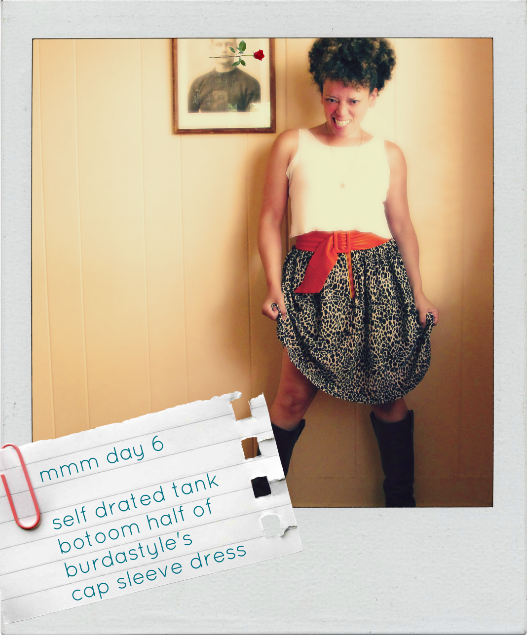 I recently lopped off the bodice of a vintage (*gasp* I know! But the bodice had dry rotted. So I'm not committing vintage murder.) dress and plan on redoing the skirt portion into an actual skirt. One day... lol. vintage murder. I LOVE IT. Heh, you're totally rocking those outfits! Me-made months are great for finally attempting those fixes, aren't they? Augh!! F21? No way, not the evil empire of child-labour-forcing, worker-screwing, environment-fecking, copyright violating, first-ammendment impinging fast-fashion shite? Please tell me you shoplifted it (and burned the store down on your way out). Nice head gear on the ancestors btw, and the makes are awesome as usual (goes without saying but I'm saying it 'cuz I care XD). AAAAW!! You look so cute in all of these fixes, it's hard to pick a fave! I'm loving your photography btw, they are real polas?